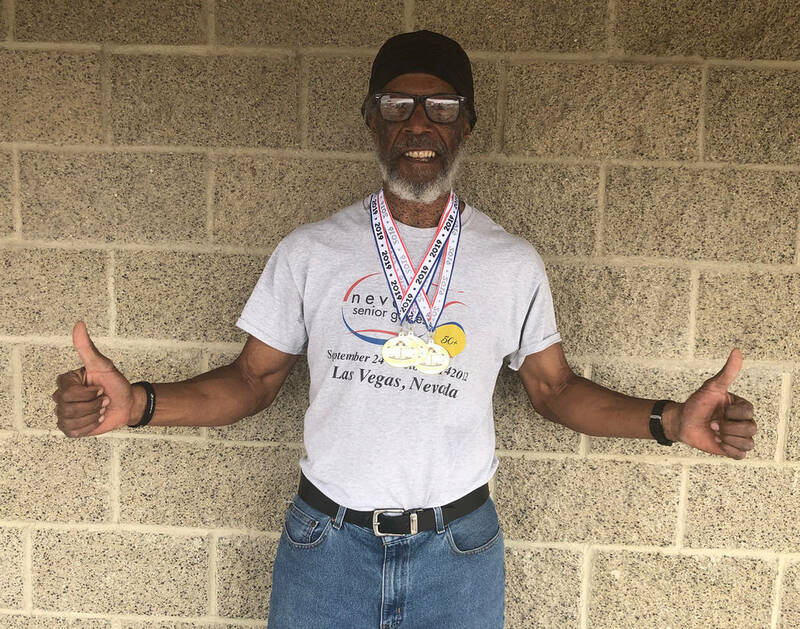 Pahrump resident Marvin Caperton conquered a new world March 23, bringing home three gold medals from the Mesquite Senior Games. 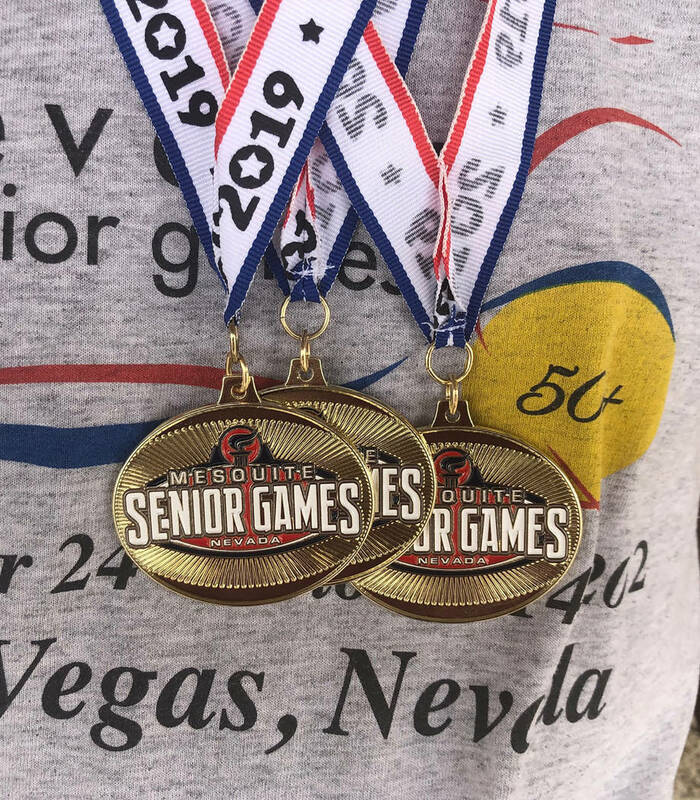 Tom Rysinski/Pahrump Valley Times Marvin Caperton of Pahrump won three gold medals in track and field last weekend in his first trip to the Mesquite Senior Games. Tom Rysinski/Pahrump Valley Times Pahrump resident Marvin Caperton shows off the medals he won in the 50-, 100- and 200-meter races last weekend at the Mesquite Senior Games. If running against other humans doesn’t provide enough motivation, for a sprinter there is always the task of running against the clock. In that area, Caperton did quite well. Caperton was especially happy with his time in the 200 meters, running it in 26.1 seconds, a time he called “phenomenal for me.” He won the 100 in 13.2 seconds and the 50 in 7.1 seconds. The National Senior Games are scheduled for June 14-25 in Albuquerque, New Mexico. Caperton said he felt good heading into the Mesquite event. Caperton said his training might not be fun, but it gets easier when he sees results. Next on the agenda is the Bay Area Senior Games, which begin April 13 with badminton and wrap up the first weekend in June with soccer. Last year, Caperton, competing in the 60-64 age group, won the 50 at the Bay Area Senior Games in 7.08 seconds, finished second to Ken Wun in the 100 with a time of 13.40 seconds and also placed second behind Wun in the 200, running it in 28.36 seconds.